Last week my classmate, the Born Again Delinquent, was knitting a dishrag. She was using a pattern she’d been taught by her grandmother, and offered to show me. I’m taking 17 credit hours this semester, I chauffeur my son to swim practice two nights a week, and I’m trying to squeeze in drum lessons. Clearly I have too much free time on my hands and need another hobby, and Tuesday I brought in a pair of needles and a skein of cotton yarn and BAD showed me how to knit a dishrag. I finished it Tuesday night at my son’s swim practice. 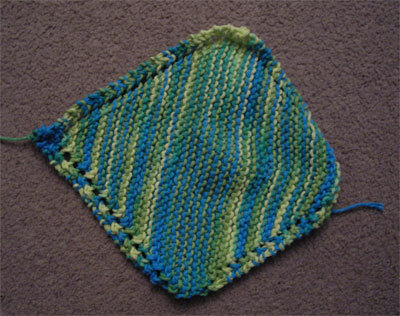 Half a dozen people came over to see what I was knitting, and several of them knew about hand-knitted dishrags and remarked on what nice rags they are. One little boy was fascinated by the idea—can’t say I blame him, I still think it’s amazing that I can take a bunch of string and turn it into something. I encouraged him to hold it and feel it. “Go ahead, you can’t hurt it.” His little brother was interested but wouldn’t touch it; I think the needles themselves were a little scary to him. I felt like the Keeper of the Lost Arts, or something. Now I just have to get BAD to show me what to do with those little tail ends of yarn, and I can start washing some dishes with it. Fair Weather Oh yeah… that’s why I don’t knit.